The TaurusForm widget is the standard way for Taurus applications to present a set of attribute and device readings and controls widgets with a form- like layout. label text. It shows the name or other identification of the item. read widget. It shows the current value of the item. If the information cannot be shown in a compact way, it may be a button that launches a separate dialog which provides detailed information. The read widget may provide information on both the read value and the quality status of the attribute, typically using the Taurus color convention. The read widget will extend over the second and third columns for those items that are not writable. write widget (only shown if the item allows writting). A widget for modifying the value of the item. If it cannot be done in a compact way, it may be a button that launches a separate dialog which provides detailed information. units text. It shows the units associated to the item (it is not shown if no units are defined for this item). extra widget. An extra space that may be used by some custom widgets (only shown if used). The precise widgets that are used by default for each item are determined by the type of attribute / class of device as well as by a custom mapping that is set at Taurus installation time. 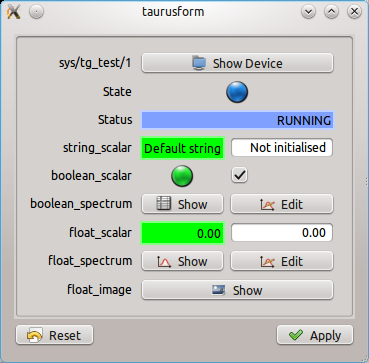 The model list is optional and is a space-separated list of models for TaurusForm. Valid models are: attribute names, device names or alias. See TaurusForm API for more information about valid models. By default, TaurusForm tries to use the most appropriate Taurus widget for representing its attributes and/or widgets. For the attributes, TaurusForm checks the type of attribute (whether it is a scalar or an array, whether it is a number or a string or a boolean, whether it is writable or read-only, etc.). For certain attributes, more than one widget may be adequate, and the form allows the user to switch between them (See the Changing the contents of a form section). 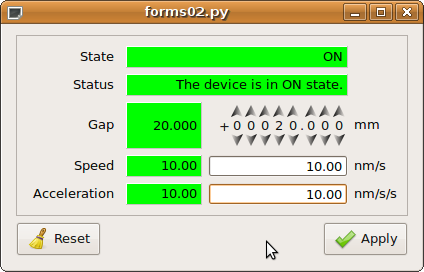 For Tango devices, the Tango Class of the device is searched in the T_FORM_CUSTOM_WIDGET_MAP map defined in Taurus custom settings and the given widget is used if there is a match. Otherwise, the default device representation is used, which shows a button that launches an AttributeForm showing all the attributes for that device. As an example, Sardana makes heavy use of T_FORM_CUSTOM_WIDGET_MAP in order to display specific widgets for its motor and channel devices. If the application using the form allows it, you can modify both what is shown and how it is shown in the form. right-clicking in the form and selecting the Modify contents option in the context menu. A TaurusModelChooser widget will let you modify the list of taurus models being represented by the form. Dropping models that you drag from another taurus widget (typically another TaurusForm, or a TaurusModelChooser). See the Drag and Drop support section for more details. which widget is used for displaying the read value or the write value of a given item. This is done by right-clicking on the label of the item and selecting the change Read Widget (or change write widget ) option. The text shown in the label widget for a value can be customised via the ‘Change Label’ option in the label’s context menu. It can also be changed for all values in a form with the ‘Change Labels’ option of the form’s context menu. You can use the Modify contents option to re-order what is shown. TaurusForm supports drag&drop of models for its items. Essentially each item represented in a form is associated to a Taurus model. By dragging the label of a given item in a form, what happens behind the scenes is that the model is copied. Many Taurus widgets can be instructed to accept drops of models (e.g. TaurusPlot, TaurusTrend, TaurusForm,...) and alter their models according to the new model passed. When a TaurusForm receives one or more models from a drop, it appends them to its current list of displayed models and shows them. If you accidentally dropped a model and want to remove the new item, just use the Modify contents option from the form’s context menu. The edition mode is left when the write widget loses focus, or the changes have been applied. Also, in many cases, when the “ESC” key is pressed. You can enable/disable the compact mode for a value by right-clicking on its label and selecting ‘compact mode’. You can also set the compact mode for all values in the form via the context menu of the form. Taurus attributes can be read-only or allow writing. Those attributes that are writable have two values: the read value and the write value. The read value is displayed by the read widget in the second column of the TaurusForm (just right of the label). The write widget, in the third column of the TaurusForm allows you to modify the write value. Since writing wrong values may be dangerous for some equipment, the default behaviour of write widgets is not to apply new values directly as you type the value or move a dial. Instead, the corresponding label of the item becomes highlighted with a blue frame, indicating that the write value has been changed (we say that the item has pending operations) and that these changes can be applied. Some write widgets give extra feedback apart from that of the label. When a widget has pending operations, you can check exactly what is the pending operation by consulting its tooltip. Example of pending operation notification: the write value of the array_scalar attribute has been changed but it is not yet applied. The label for this item shows a blue frame, the write widget shows bold blue text and the tooltip gives extra information. The way for applying changes for a single item may depend on the write widget involved, but typically (it is the case for all default widgets) it is done by pressing the Enter key on the write widget (see also the Forced apply section). For applying all pending operations of a whole form at once, you can click on the Apply button of the form (if available). If the form provides buttons, the Reset button will discard all pending operations. By default, if a write value has not changed, there will be no pending operations and therefore the value cannot be re-applied. Some times, however, it may be interesting to force another write of the same value (e.g. a certain hardware device needs an extra “push” to reach the desired value). This can be done by pressing CTRL+Enter (instead of just Enter ) on the write widget. When the read value of an attribute is updated in the control system, the read widget for that attribute will reflect the new value (depending on the configuration of the control system, a certain refresh period may be waited). When the write value of an attribute is updated in the control system (a certain attribute may be accessed simultaneously from different client aplications or even from different parts of the same application), the item representing that attribute will be notified, but the value displayed by the write widget will not be changed (instead, the item will show that there is a pending operation). In this way, concurrent editions will not interfere with your own editions, but at the same time you will be aware of them. Remember that you can check the cause of a pending operation by consulting the write widget tooltip.